Antlers are bony, deciduous (meaning they fall off annually) growths, elongated and branched, that grow two to three inches above the eyes of male deer. Arguably, they are a buck's most important asset. Though it may take three to five years before a buck can win the full benefits provided by antlers, when that time comes, antlers are the key to the best of everything a buck can desire: dominance over many other bucks and all antlerless deer living within its range. Perhaps even dominance over all other bucks within its range, getting the best (most ideal habitat) and largest of home ranges, the most secure bedding area, the right to evict — without opposition — other deer from desirable foods and bedding spots and, most important of all, the ability to hold an exclusive breeding range throughout the November breeding phase of the rut. 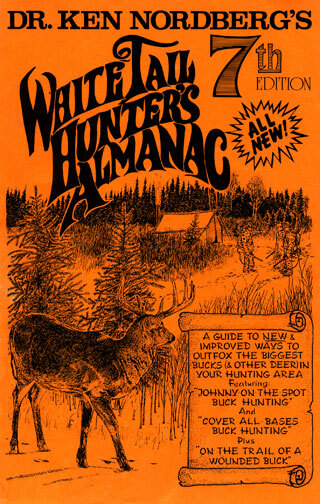 Strangely, but perhaps not so strangely, antlers are also important to those of us who hunt whitetails. Though some hunters may deny it, the degree to which we humans prize these bony growths is reflected by what typically happens whenever a deer with high and wide antlers is spotted: a surge of adrenalin suddenly makes it difficult to accurately aim a firearm or bow. This handicap, plus the fact that mature bucks are among the most elusive of the world's big game, prompts many of us who finally succeed at taking one to rush our trophies to taxidermists to create lifelike mounts to be hung on the wall to commemorate this exciting feat. Actually, antlers can provide the hunter with something of vastly greater value than merely being something pleasant to gaze at. 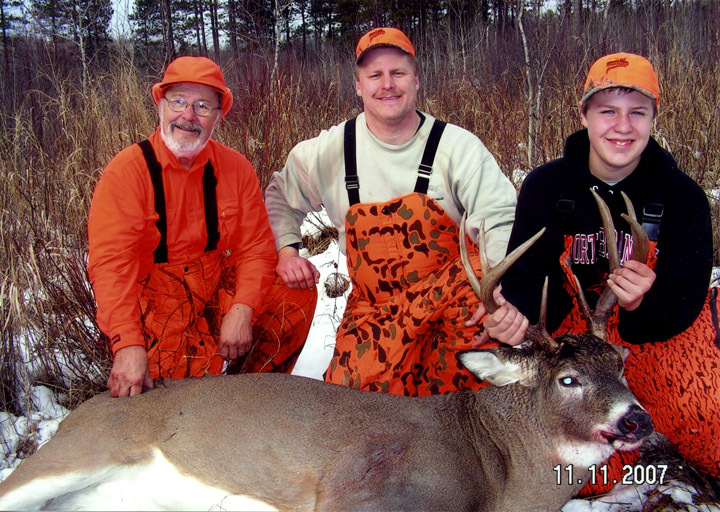 An understanding of the role antlers play in the lives of bucks greatly improves buck hunting success. Here's what you need to know. Antler growth begins in late April or early May, beginning with the appearance of knobs covered with a soft, fuzzy, tan, leathery tissue called “velvet” on the foreheads of bucks. Rich with blood vessels and nerves, this sensitive tissue provides the genetically-influenced form for antler growth. Antlers of wild bucks grow progressively larger during each of a buck's first five years of life. Inside the velvet antlers begin as rubbery cartilage, in turn calcifying to become dense bone. Growth and calcification are complete by the end of August, at which time blood flow to the velvet shuts down. 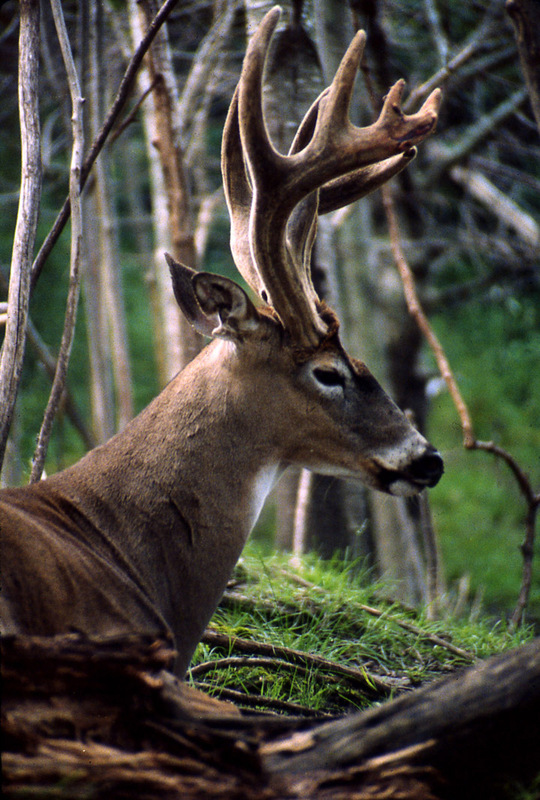 A trophy-class buck with its velvet still on its antlers. Velvet then begins to deteriorate (decay), making it easily torn open when inadvertently brushed against branches. A trophy-class buck with a wound in his velvet. Exposed, underlying tissues, still sensitive, immediately begin attracting meat-eating flies and yellow jackets. Some time during the last few days of August or first few days of September, bucks (most besieged by tormenting insects while bedded) rush to small-diameter tree trunks or woody shrubs with single or multiple trunks to rid themselves of offending velvet. 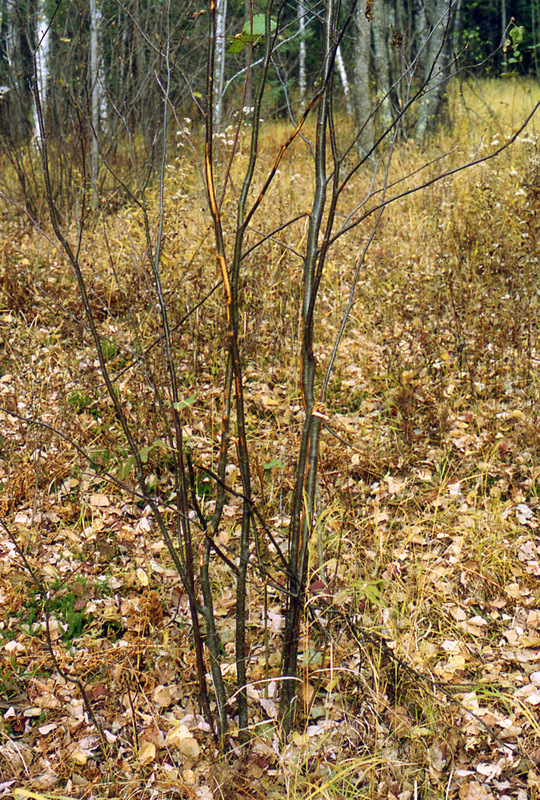 A “velvet rub.“ This is a classic example of a cluster of small trees used by a buck to clean its velvet. This velvet rub could have been made by a smaller buck, or a trophy-class buck. 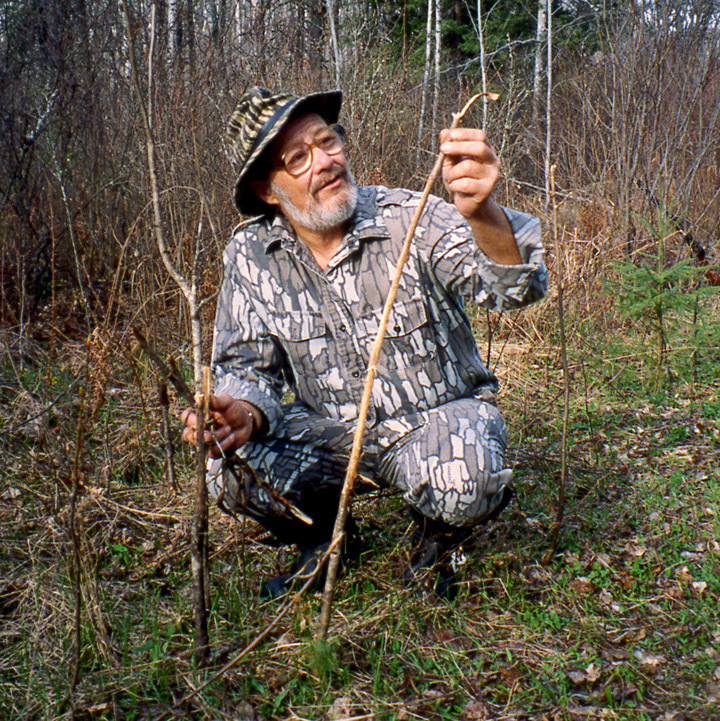 Small, bendable branches are used by most bucks because the velvet is sensitive. In this case, the velvet rub is old enough that visible traces of blood have been washed away by rain. In a matter of minutes roughly 85% of bloody velvet will be scraped off, after which the buck will vigorously sweep its antlers from side to side through deep vegetation or well-leafed, low-hanging tree branches in an effort to wipe off remaining blood and tatters of velvet. 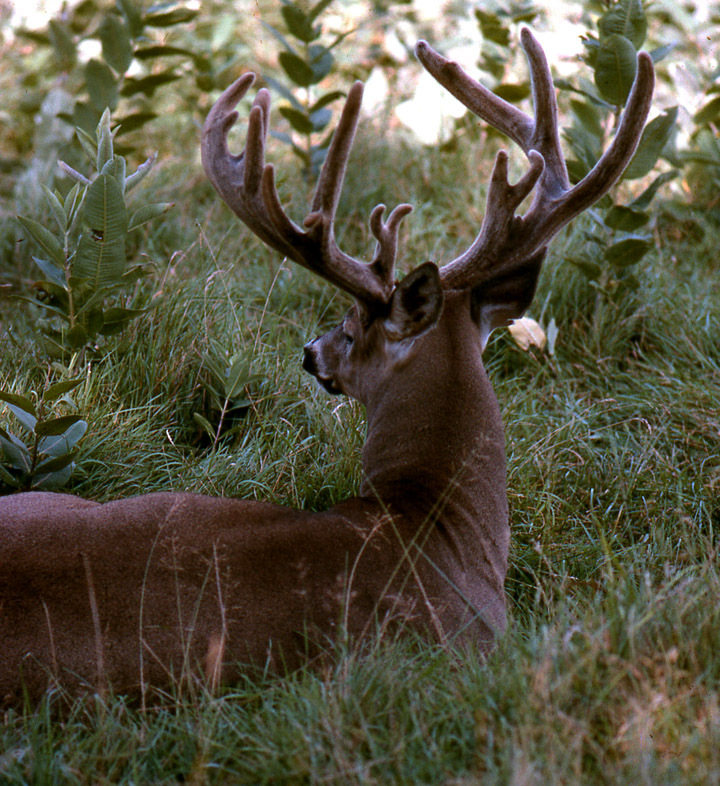 A trophy-class buck finishing cleaning his velvet off in tall, green vegetation. A trophy-class buck after its initial bout of cleaning the velvet from his antlers. 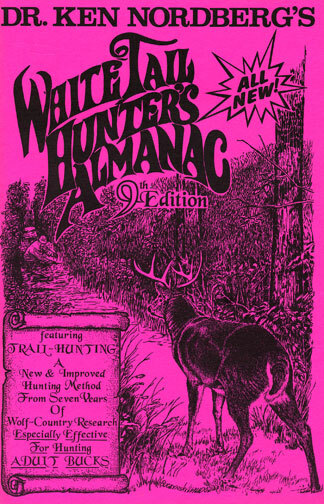 Generally, however, it will take several days of intense antler rubbing to complete the job. 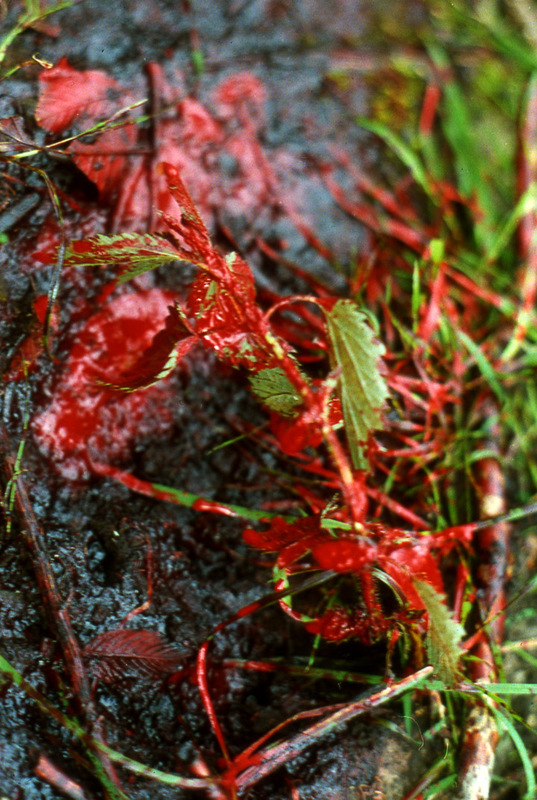 The blood left after the buck cleaned its rack of velvet. To scrape velvet from sharp angles where tines meet main beams, bucks rub on small diameter tree trunks or woody shrubs, in the process rubbing off bark and sometimes fracturing the trees or shrubs, creating classic September velvet rubs. 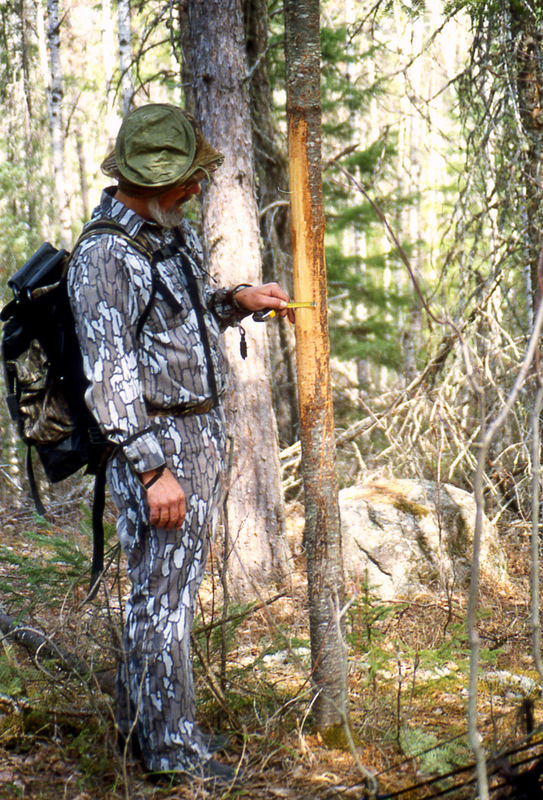 Doc inspecting a broken branch from a classic September velvet rub. Though rubs made at this time do not reflect the size of the bucks that made them, adjacent tracks and droppings do (tip No. 1). Moreover, easily spotted velvet rubs are almost always made within or near buck bedding areas (tip No. 2). Antlers of buck fawns rarely grow past the initial knob stage. Yearling bucks of forest areas typically grow antlers with one (spikes) or two (forkies) points, having main beams measuring six to 11 inches, about 3/4-inch in diameter at their bases (just above the so-called “buttons”) and have an inside spread of only six to ten inches. It is commonly believed spike bucks are inferior genetically. A 20-year study I began back in 1970 revealed most spike bucks are spikes simply because they have insufficient calcium for maximum antler growth in their diets. Owing to more nutritious foods, richer in calcium, antlers of yearling farmland bucks are usually larger than those of forest yearling bucks and not uncommonly have as many as six to 12 measurable tines. Where I hunt, antlers of 2-1/2-year-old forest bucks have six to eight points with foot-long main beams. Bases are slightly less than an inch in diameter and antlers have an inside spread of 14 inches, plus or minus an inch or two. Typically, a 2-1/2-year-old will appear to be a mature buck, but when viewed from front or rear, its antlers will not be nearly as wide as its body or ears extended horizontally to the sides (tip No. 3). Our 3-1/2-year-0ld bucks usually have antlers as wide as their bodies or ears but their antlers lack the overall mass characteristic of older bucks. They're thinner (tip No. 4). Typically, our 3-1/2-year-0lds have antlers with eight to ten points. Bases are usually about an inch in diameter and inside spreads run about 16 inches, plus or minus an inch or two. Thought antlers of wild white-tailed bucks generally reach their maximum size at age 5-1/2, while hunting I cannot see the difference between antlers of 4-1/2-year-olds and 5-1/2-year-0lds. At these ages most of our bucks are 10 pointers with bases measuring up to 1-1/2 inches in diameter. A few will be 12–14 pointers. Upon spotting a buck of either age, it is instantly apparent their antlers are much heavier (thicker) than antlers of 3-1/2-year-olds. Most have widely sweeping antlers that are somewhat wider than their bodies or horizontally extended ears, sometimes a great deal wider (tip No. 5). Inside spreads are mover variable than spreads of younger bucks, measuring anywhere from 18 to 26 inches. A few of our older bucks have unusually narrow spreads. [Our taxidermist often talks about this. He has noted that farmland bucks tend to have wider racks — while the bucks we bring in from our deep woods area often have narrower racks, or racks where the tips of the main beams come close together.] A 300-plus-pounder recently taken by a grandson measured only 16 inches from main beam to main beam but its antlers had a lot of mass. The last 6-1/2-year-old buck I tagged had notably high and wide, 10-point antlers as a [when it was] 3-1/2- to 5-1/2-year-old. 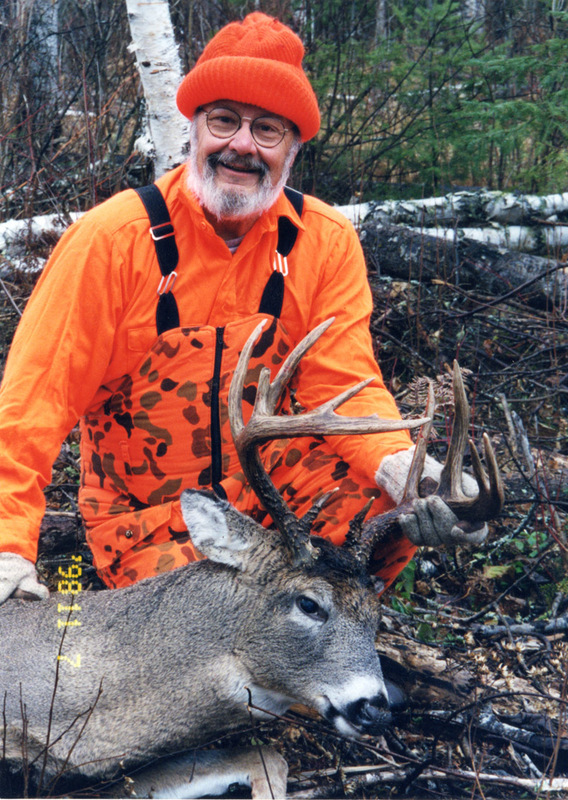 At age 6-1/2 it was a 13-pointer and though its antlers still had plenty of mass, bases measuring 1-1/2 inches in diameter, its main beams, tines and spread were shorter than during previous years. 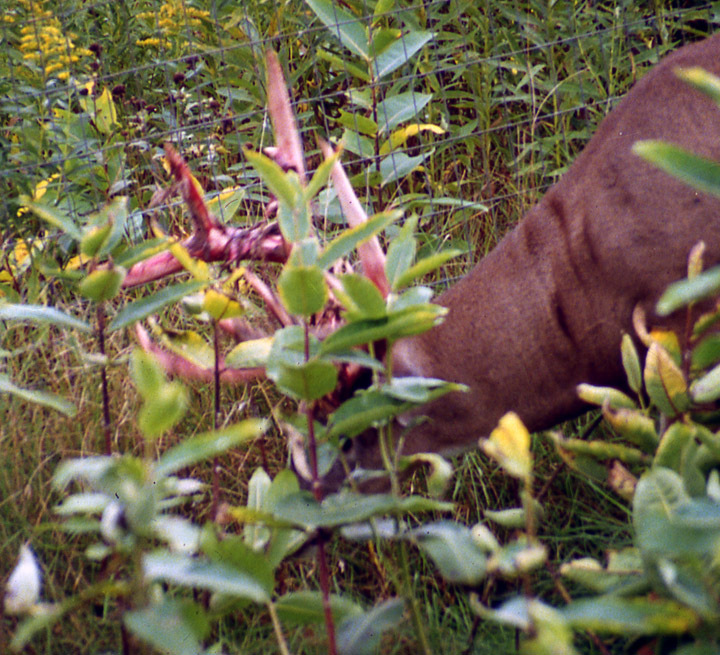 This is typical for wild bucks of this advanced age (molar teeth well flattened and very dark in color). Though wild does can live 10-14 years, few wild bucks survive past their seventh winter. Once velvet is shed, bucks are anxious to try out their new antlers on other bucks. Throughout September and much of October, they congregate in favorite feeding areas where they frequently spar (short term and not serious) or battle (long term and serious especially in October). Bucks with the greatest weight and strength, a more aggressive nature and larger antlers (having more and longer tines with a greater width) generally vanquish all other bucks within their ranges (the surrounding one to two square-miles). 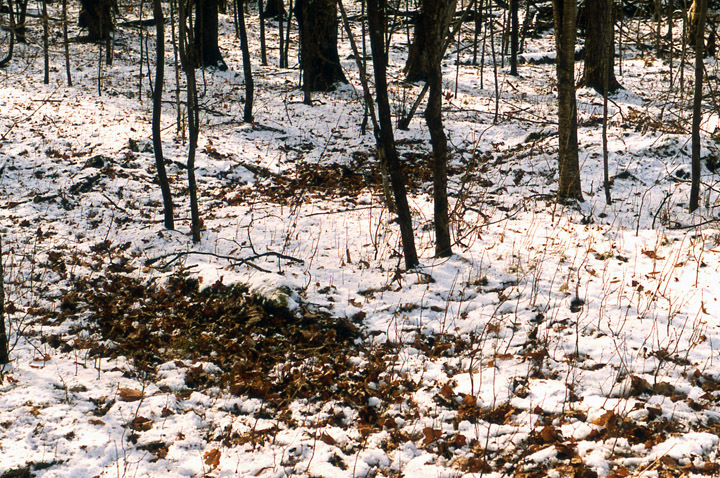 Two patches of ground with snow, leaves, and dirt thrown aside during an intense buck battle. Battles that end with the death of one or both bucks (antlers locked) are relatively rare, most occurring while does are in heat in November. 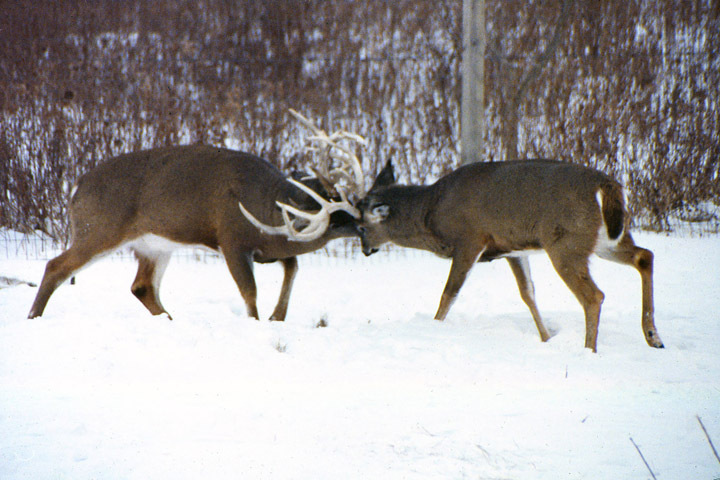 To gain dominance (for a year) over another buck, all the victor has to do is engage antlers with an opponent and either force it to give ground and/or leap away to avoid injury. 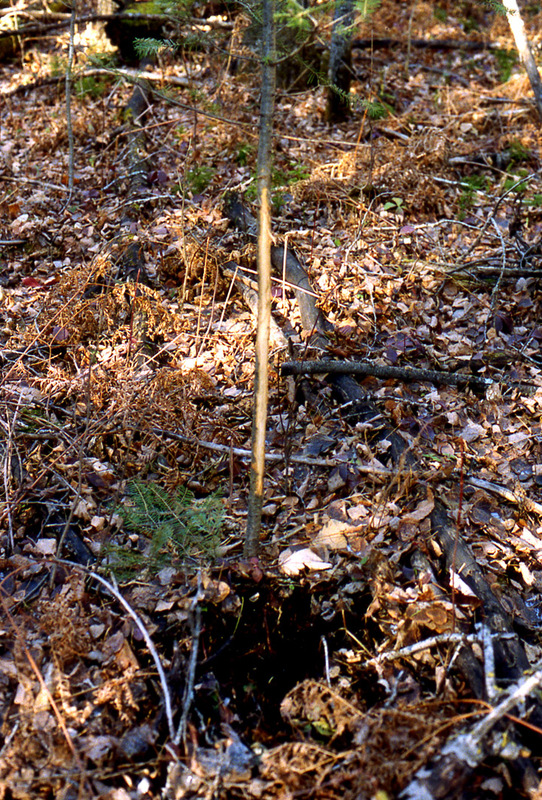 A young buck's antler rub and ground scrape — probably made by a 1-1/2-year-old buck. At this time, diameters of rubs reflect sizes (weights) of the bucks that made them. 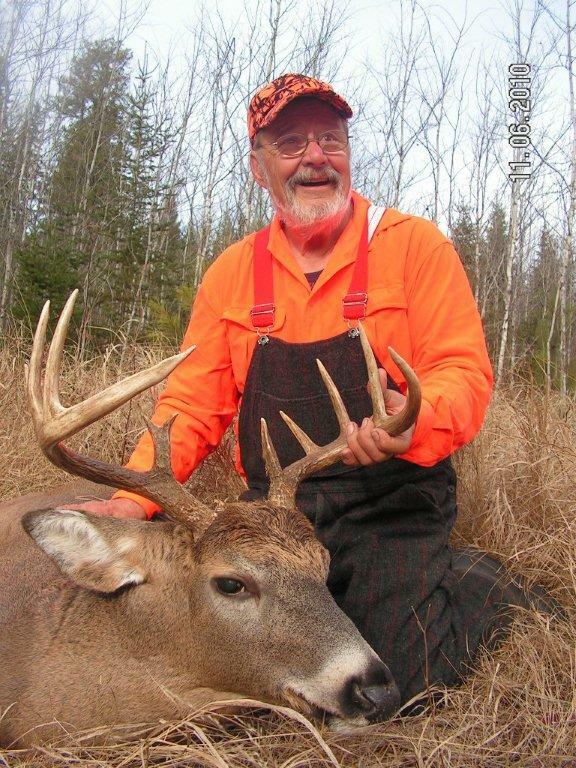 This is an impressive antler rub made by a trophy-class buck in its prime — probably a 5-1/2- or 6-1/2-year-old buck. While making a rub — removing bark to make the sign highly visible and depositing acrid scalp musk making it easy to smell — bucks typically attack a tree trunk as if it is a live opponent. To win the battle, the tree must bend, but the purpose of making the rub would be defeated if the tree broke. For this reason progressively heavier bucks select progressively thicker tree trunks to rub on. Our yearlings prefer to rub on tree trunks an inch or less in diameter. Our 2-1/2-year-olds use tree trunks 1-1/2 to 2-1/2 inches in diameter. Our 3-1/2- to 6-1/2-year-old bucks characteristically rub on trunks three to six inches, sometimes more, in diameter (tip No. 7). Within a few days after rubbing begins, the most dominant buck of the area will chase all other antlered bucks from its chosen breeding area, marking main deer trails within doe home ranges with its signs to warn lesser bucks to keep away. Until November breeding begins, average dominant bucks in my hunting area will make and regularly renew the musk of 30 or more breeding range rubs and another six to 12, sometimes a lot more, within or very near its bedding area (tip No. 8). While temporarily living off-range, lesser bucks continue to make and renew rubs (tip No. 9). However, if it is unseasonably warm during this period, now well-furred bucks may completely neglect physically demanding antler rubbing. Aggressiveness between bucks in fall and early winter is fueled by peaking testosterone in their bloodstreams, but obviously something more is involved. 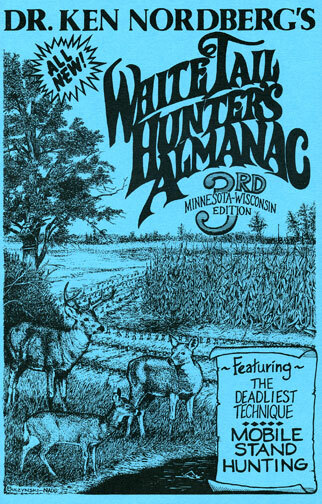 I know a man in Wisconsin who has raised whitetails in a penned area as hobby for many years. One of his bucks became extremely aggressive while does were in heat, one year even killing a larger 10 pointer. One year, on becoming weary of having to put up with the buck's dangerous behavior (and its determination to damage fences) he roped the buck and sawed off its antlers. The change in the buck's behavior was extraordinary. Almost immediately it became completely docile. Likely reflecting the physical demands of establishing and holding a breeding range — cruising its range day and night from two weeks before breeding begins until breeding is over, renewing its rubs and scrapes, searching for displaced bucks that dared to return and feeding and sleeping little — exhausted dominant bucks are first to shed their antlers between December 22nd and Christmas when Minnesota whitetails traditionally head to wintering areas. 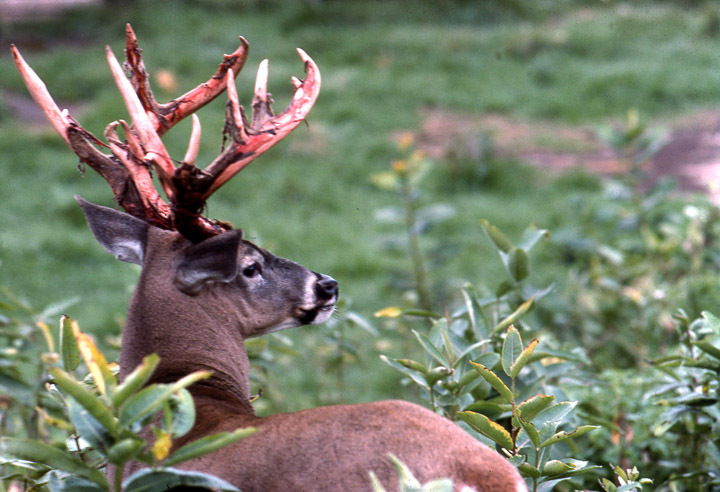 Immediately upon shedding antlers, a dominant buck cannot (or will not) breed. The 5% of does bred in late December or the first days of January are therefore bred by bucks lower in the local buck hierarchy. Last to shed antlers are yearling bucks, some yet antlered well into the following April. This can provide a yearling with an unusual opportunity to gain revenge on the dominant buck, now anterless, that repeatedly forced it to abandon its range via threat or battle from mid-October to late December. It can now attack the formerly feared titan, head down, antlers poised to inflict serious injury, forcing the astonished, much-larger buck to flee with all possible speed. 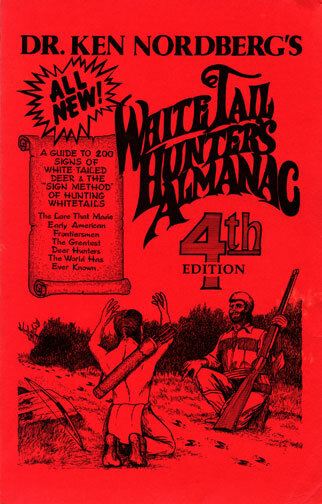 To end this treatise on antler lore, I have a question that suggests there is still another function of antlers: would whitetail hunting be as exciting as it is if bucks had no antlers?